Henrik Stenson's 2013 good form continued into the 2013 FedEx Cup Playoffs, when he won the Deutsche Bank Championship by two strokes over runner-up, Steve Stricker. It was the Swede's first PGA Tour victory in over three years. He tied the tournament record of -22 en route to his third career PGA Tour win. The win vaulted him into first place in the FedEx Cup standings just ahead of Tiger Woods. On September 22, 2013, Stenson won The Tour Championship at East Lake Golf Club and the FedEx Cup. 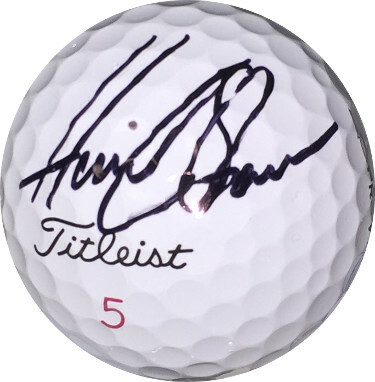 Henrik Stenson has hand signed this Titleist #5 Golf Ball. PGA Tour Hologram and Certificate of Authenticity from Athlon Sports Collectibles.